TIP: The whey adds browning and lift but does not affect the flavour. Leave it out if you want a dairy free loaf. DO NOT preheat your slow cooker (and whatever you do, DO NOT feed it after midnight 😉 Yes I remember Gremlins). As always, add the yeast to the warm water along with 2 teaspoons of sugar. Stir to combine and set aside. In your electric mixer bowl, add the flours, xanthan gum, salt, and 2 tablespoons of sugar. Mix together well. To this, add in the water/yeast mixture and the oil. Beat on low speed to combine. Then beat on high for 2 minutes, scraping down the sides of the bowl periodically. Method 1: You can grease the inside of your slow cooker with oil and turn the batter directly into the cooker to bake. Shape it into a round or oval form and smooth using wet fingers. Slice an X or a few lines (e.g. / / /) across the top to allow for expansion. This method will result in a flat loaf and will produce slices shaped like biscotti. Method 2: This is the method shown in the photograph. Grease a metal loaf pan well and pour/spoon the batter into it. Again, smooth the top with wet fingers and slice a few lines across the top. Do not press the batter into the pan. It should have some room to expand as it rises. Place the pan in the slow cooker to bake. Okay, NOW you can turn on your slow cooker! Put the lid on and turn it onto the high setting. To allow steam to escape, wedge the lid up a tiny wee bit by laying a toothpick or some such thing between the edge of the cooker and the lid. 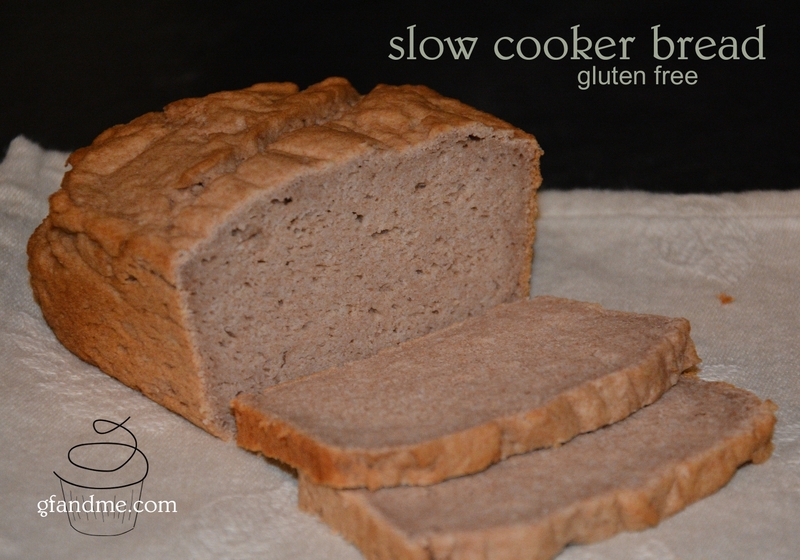 When you return, you will have a beautiful loaf of gluten free slow cooker bread. Remove it from the cooker and place on wire rack to cool. When it’s warm it has that rice flour taste, but this disappears when cool. As I said in the preamble, this bread gets better with age. Store on the counter, wrapped tightly for up to 4 days. This entry was posted in Baking, Recipes, Uncategorized and tagged almond flour, bread, dairy free, gluten free, oat flour, Slow cooker, teff flour. Bookmark the permalink. We have folks with tree nut allergies as well as gluten. What can we do instead of Almond flour? Coconut, or just 1/4c more of brown rice? Also, can ground flaxseed replace the teff? Haven’t seen that locally and I’d hate to order a bag for such a small amount. Thanks! Hi Laura. I think coconut flour would dry out the bread but you could certainly use more rice. It just may not have the the same aging properties. And I think ground flax seed would work wonderfully. Teff is expensive but we love it – especially in breads. If you try the bread without the almond flour, please let me know how it turns out. I am highly allergic to rice, do you know a combination I can use that cuts out the rice flour? I haven’t found any good bread recipes yet and it is one of my biggest struggle . I would try replacing the rice with quinoa or one of the bean flours. Just be sure to let the bread completely cool before eating. The bean flours can make things taste bitter when they are still warm. Good luck! Can you replace the oat flour with anything? my son is sensitive to any grain!! You could replace it with more rice or even half rice and half almond. Its really just there for nutrition and to add some lift. If you try it, please let me know how it works. Hi. I just love the look of your breads. They make my mouth water. I’m going to give this one a go, although I have to avoid yeast so it won’t rise, but I’m sure the taste will be there. Thanks and please let me know how it turns out. Always like to make gfandme’s recipes open to more folks with different food intolerances.